Who Elsa? : Check in #1 -- Whose world is it? Yesterday was a 12-hour, physical labor workday. Yes, I took breaks here and there and no, the type of labor I was doing was *nothing* compared to what some folks do for a living. But let's just say that, for me, the work was tiring and today I am tired, achy, and not at all looking forward to round two (coming up in a few minutes). I didn't interact with many people yesterday, yet I somehow managed to trip up considerably on day #1 of my challenge. Yikes! Don't get me wrong, I did have some moments of remembering and executing my mission. However, most of those moments were when I was alone and there was nothing happening to test my resolve. I started off well enough, waking up before my schedule required to make breakfast for Christian. After he left the house, I gave myself an hour of Elsa time and then got down to business. While I was working, I imagined how psyched Christian would be about all the progress I made while he was gone. I found and laid out all the necessary tools, affixed a small section of drywall, spackled, sanded, and primed primed primed. That's kind of sweet, right? But when Christian called to check in, a simple question he asked gave me the impression that he felt I wasn't making quick enough progress. I felt taken for granted. Even worse, I reacted to that feeling in what I am sure was not a very Toscanini's behind-the-counter-guy kind of way. To begin with, I know that Christian's time estimates for himself are usually over-optimistic. It would stand to reason then, that his time estimates for other people would carry with it this same characteristic. He meant no harm by it and in fact, I am confident his question was geared toward helping me remove any obstacles that may have been hindering my (hyper-speed) progress. But, more importantly, it should not have mattered whether or not he appreciated how hard (or fast) I was working since my intention for that day was for my work to be a gift to him. 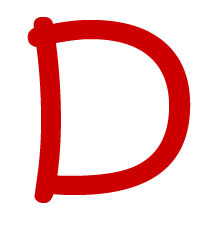 My grade so far is a D at best. Good thing that today is a new day and I get a chance to try again.